What is the best time to visit Guruvayoor? Guruvayoor can be visited anytime during the year, however December to February is the best time for sightseeing. You can even travel to Guruvayoor during the annual festival, which typically happens in the month of February or March. It is best to avoid summer season as the hot weather makes it difficult to roam around the town. Which are the top 5 must visit places in Guruvayoor? Guruvayoor Temple, Punnathurkotta Elephant Palace, Mammiyoor Shiva Temple, Institute of Mural Painting and Parthsarathy Temple are the top 5 places to visit in Guruvayoor. How can I get attractive discounts on hotels in Guruvayoor? 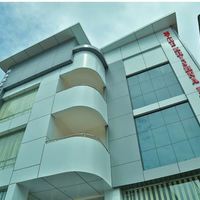 For hotel booking, one can go through online travel sites like Cleartrip, where all types of hotels in Guruvayoor are available from budget hotels to 5-star hotels. You can also use a valid coupon code to avail the best deal along with other benefits. Price comparison is essential before making the final booking. Can unmarried couples stay in hotels in Guruvayoor? You may find some hotels in Guruvayoor where unmarried couples can stay. However, it is essential to carry a valid ID proof such as voter ID, Passport, Aadhar card, etc. to show at the time of check-in. How can I find hotels near Guruvayoor Sri Krishna Temple? You can easily find hotels near Guruvayoor Sri Krishna Temple on Cleartrip by entering Guruvayoor Sri Krishna Temple in the Where field option on the Hotels Page. The lists of hotels near the Guruvayoor temple will be displayed in the search results and you can book as per your need and budget. How do I book budget hotels in Guruvayoor? 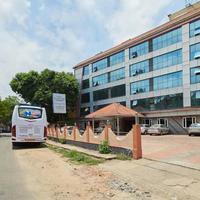 Budget hotels in Guruvayoor are quite popular and offer comfortable stay at affordable prices. 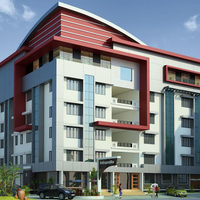 Some of the popular budget hotels in Guruvayoor are Mayura Residency and Guruvayoor resort. Do Guruvayoor hotels offer Wi-Fi facility? Almost all the hotels in Guruvayoor offer free Wi-Fi as part of the stay. For hotels with Wi-Fi, one should contact the hotel and get confirmation on this matter before booking. What can I buy from Guruvayoor? You can buy CDs of devotional songs, kerala style clothes, dress materials, antiques, local food items like pappadams, murukkus, embroidery items, handicrafts and idols of gods and goddesses, etc. Can you tell about the biggest festivals in Guruvayoor? The major festivals of Guruvayoor include Ekdasi Festival which is celebrated on the eleventh day of every lunar fortnight. Another major festival is Utsavam, which is celebrated every year in the month of Febraury or March. Saraswathy pooja is also held on the last three days of Navaratri festival. Can you list the top 5 vegetarian restaurants in Guruvayoor? The best five places to enjoy local cuisine are Theertham, Ganapathy Bhavan, Indian Coffee House, Kaustubham and KTDC Mangalaya restaurant. What are the famous sightseeing spots in Guruvayoor? The most famous sightseeing spots in Guruvayoor are Guruvayur temple, Chavakkad Beach, Mammiyur temple, St. Thomas Syro-Malabar Church, Palayoor, Sree Parthasarathy Temple, Gajarajan Kesavan Statue, Guruvayoor elephant camp, Chamundeswari Temple, Chowalloor Shiva Temple, Nava Mukunda temple and Venkitachalapathy Temple. What are some must do things in Guruvayoor? The divine destination of Guruvayoor is increasingly becoming a popular tourist destination. One and most important thing to do in Guruvayoor is to visit the Sri Guruvayurappan Temple to get the darshan. Another major tourist attraction is Elephant Park, where you can walk alongside fifty to eighty elephants. You can also enjoy watching the beautiful sunset on the Blangad beach. Can you suggest a few hotels with restaurant in Guruvayoor? 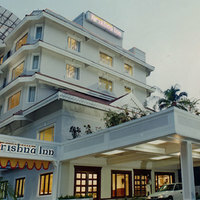 Some of the hotels with restaurant in Guruvayoor are Bhasuri Inn Hotel, Hotel Devaragam, Hotel Fort Gate and many more. What activities and experiences can I enjoy in Guruvayoor? After experiencing eternal peace at Guruvayoor temple, one can enjoy boating in Chettuva. Walking alongside fifty to eighty elephants is another great thing to experience in elephant camp. How to book a room for international guests near Elephant Camp Sanctuary, Guruvayoor? If you are looking for stay options near Elephant Camp Sancutary, then Sree Krishna Kailas Inn, Hotel Pushpanjali, and Hotel Fort Gate are some of the great options to choose from. Go to the Guruvayoor Hotelspage on Cleartrip website, and select elephant campfrom the landmark dropdown. 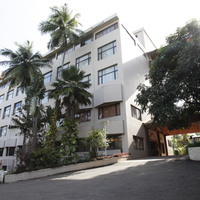 Select the hotel from the list of options and book the one which is best suited for international guests. From where can I book a good holiday package in Guruvayoor? Book the best travel package using Cleartrip. Check out the Guruvayoor Holiday packages and avail amazing discounts and other benefits too. 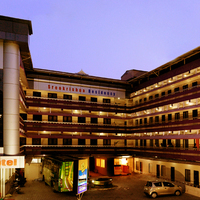 Can you name some 4-star hotels in Guruvayoor? 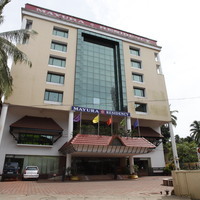 Some of the popular 4-star hotels in Guruvayoor are Mayura Residency, Kanoos Residency, and Krishna Inn. Book your travel and accommodation through Cleartrip and get instant cashback on bookings. Can you list some hotels in North Guruvayoor? 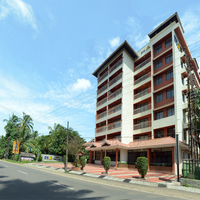 In North Guruvayoor, Sri Anandan Residency, Hare Krishna Inn, Hotel Krishna Regency are few of the options. For more details, you can choose North Guruvayoor from the ‘Hotels By Region’ drop-down hotels in Guruvayoor page on Cleartrip. Can you name some hotels with gym in Guruvayoor? 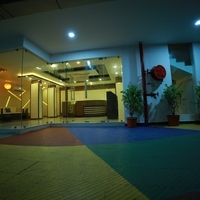 Kanoos Residency and SFS Home Bridge are two hotels with gym in Guruvayoor. What are the top hotels to stay at Guruvayoor? 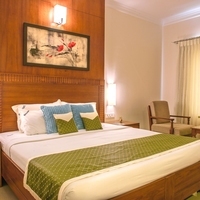 Looking for top hotels in Guruvayoor for a comfortable stay? Then go for Mayura Residency, Kanoos Residency, and Krishna Inn. How far is Guruvayoor Temple from Guruvayoor Railway Station? The total distance between Guruvayoor Temple and Guruvayoor Railway Station is about 1km. The travel time between the two places is close to 4 minutes. Which are the best temples to visit in Guruvayoor? Guruvayur Temple, Mammiyur Mahadevan Temple, Sree Parthasarathy Temple, Chamundeswari Temple, Chowalloor Shiva Temple, Nava Mukunda temple, Venkitachalapathy Temple are some of the best temples to visit in Guruvayoor. What are the top places of interest in Guruvayoor? Guruvayur temple, Chavakkad Beach, Mammiyur temple, St. Thomas Syro-Malabar Church, Palayoor, Sree Parthasarathy Temple, Gajarajan Kesavan Statue, Guruvayoor elephant camp are few top places of interest in Guruvayoor. 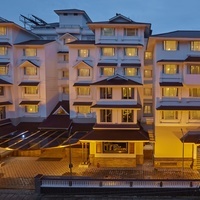 Can you tell me about some 3-star hotels in Guruvayoor? 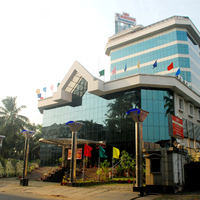 Some of the 3-star hotels in Guruvayoor are Chandana Inn, Bhasuri Inn Hotel, and Hotel Fort Gate. All of these hotels offer the best amenities. For booking your travel and stay, log on to Cleartrip website. Which are the travel options to reach Guruvayoor? One can reach Guruvayoor by flight; the nearest airport is Kochi International Airport, which is 80 km away. There is also a railway station, which is connected to the Madras-Mangalore main line at Thrissur. Are there any budget hotels in Guruvayoor? 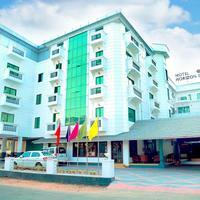 Yes, you can find many budget hotels in Guruvayoor. 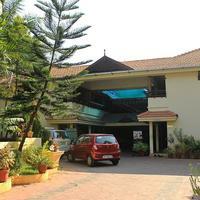 There are some budget hotels that offer the pay@hotel facility like the Guruvayoor resort. 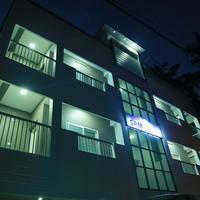 Check out Cleartrip.com for the best deals and to book the best budget hotel in Guruvayoor. Is pool facility available at hotels in Guruvayoor? There are few hotels in Guruvayoor which has pool. 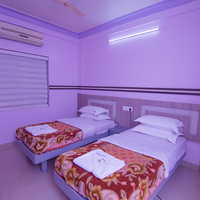 For complete details on hotels with pool in Guruvayoor, visit Cleartrip website and book the best hotel which meets your requirements and budget. Do hotels in Guruvayoor offer AC? 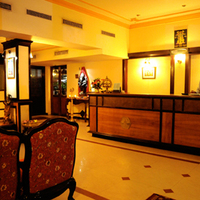 Yes, there are many hotels which offer air conditioning facility. 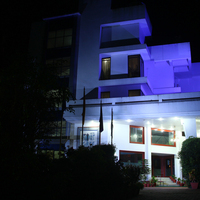 Sreekamal Residency is one such hotel you can consider. 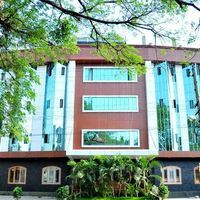 Check out more hotels in Guruvayoor with AC on Cleartrip. Where can I go for weekend getaway from Guruvayoor? From Guruvayoor, one can visit Thekkady, Aluva, Ernakulam, Kumarakom, Kochi, Wayanad, Kodaikanal, Alleppey and Coimbatore for a weekend gateway.